See the RV Careers Squad in Action at an Event Near You! 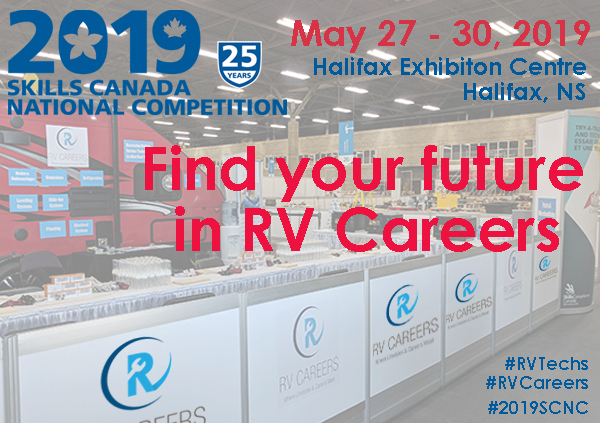 RV Careers (brought to you by the Recreation Vehicle Dealers Association of Canada) is on the road and participating in various career and skilled trade fairs! We are on a mission to let everyone know how versatile the RV Service Technician (Red Seal) trade is; one that includes at least 14 different skilled trades. The Canadian Recreation Vehicle industry is a $6.1B industry that generates many jobs and the technology is constantly evolving. One of our annual stops is at the Skills Canada National Competition (SCNC). SCNC is the only national, multi-trade and technology competition for students and apprentices in the country. Every year, more than 550 students and apprentices from across Canada come to SCNC to compete in over 40 skilled trade and technology contests. Through these competitions, Skills/Competences Canada seeks to raise awareness about skilled trade and technology sectors to youths and their influencers. This is just one of the places we go to showcase our industry and the RV Service Technician trade! Come visit our booth with incredible activities planned in Halifax, NS from May 28 to 29 at the Halifax Exhibition Centre! We are a small trade by number but the industry and its reach are by no means small! RV dealerships can be found in all Provinces. 15% of Canadian households own an RV. That’s a lot of people that need parts and service! Do you see your future in RV Careers?